I tried something new this year to add a little cheer to our Christmas decor. 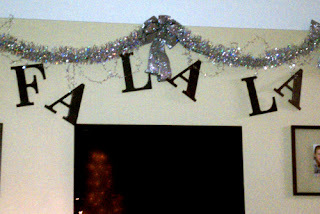 I purchased these large wooden letters from Hobby Lobby and painted them dark brown with silver embellishments. They fit nicely over the blank space above our TV. I think they turned out cute. I wasn't quite sure about the garland, but it was kinda funky so I went with it. The pic is from my phone, so you can't really appreciate the colors and texture, but you get the gist. Today I came across this idea from Frugal With a Flourish that uses the same type of letters so I think I'll have to try that next year!